Vinyl records are a thing again. I don’t understand the fascination at all, but if that’s something you’re into, Amazon’s discounting several turntables from 1byone and Electrohome to as low as $40, today only. 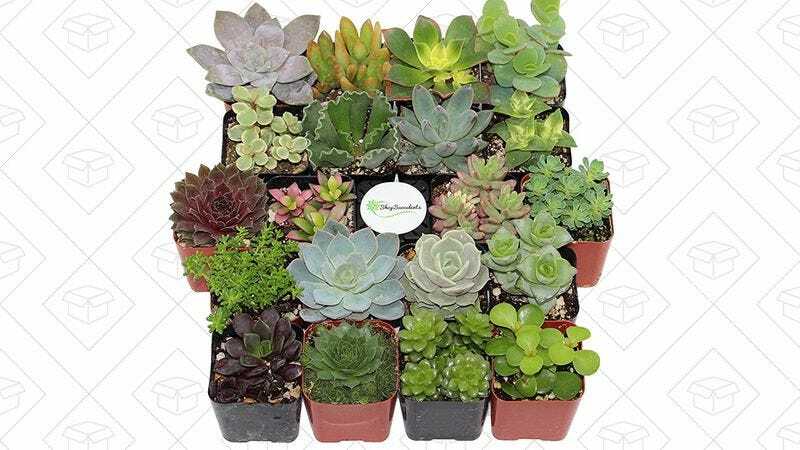 For the first time in my memory, Amazon’s running a one-day Gold Box deal on a collection of 20 succulent plants shipped right to your door. Each plant is unique and comes in a 2” pot, but many of them will be ready to transfer to a larger arrangement. Just remember, the green ones do well indoors, while purple and orange plants will be happier on your patio. It’s easy to see why Cuisinart’s DBM-8 electric burr coffee grinder is Amazon’s top seller in the category. It’s affordable, it’s dead simple to use, it includes 18 coarseness settings, and it looks great. Today’s $35 price tag is roughly $10-$15 less than usual, so perk up, and lock in your order before it sells out. We love Pyrex around these parts, and their 3-pack of measuring cups is down to $13 today. In addition to looking great, the cups are microwave and (semi) dishwasher safe, and since they’re made of glass, they won’t absorb any odors, flavors, or stains. Plus, they just feel heavy and professional, and would make a nice gift. Contigo’s Autoseal travel mug has long been a reader favorite, but the new Autoseal Chill looks like a great companion water bottle. It launched this month for $23, but now you can get it for $20, with several different lid colors.